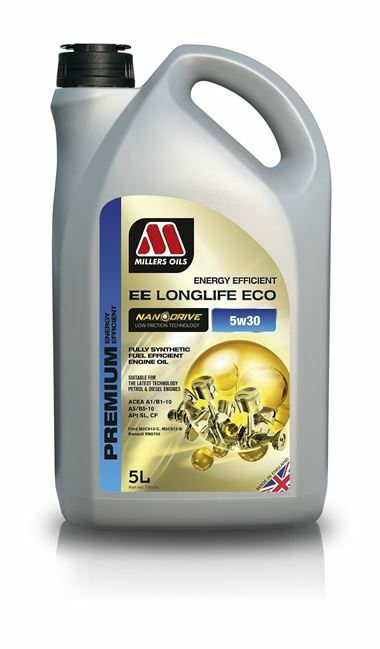 Millers Oils has launched a new range of Energy Efficient oils employing Nanotechnology that have been proven to cut fuel costs by up to 2.5% and reduce engine wear. The oils reduce friction and the result is a potential 2.5% improvement in fuel economy and up to 50% reduction in engine wear. One way to improve fuel economy in an engine is to use a lower viscosity of oil. The consequence of this, using traditionally formulated oil, can be that at operating temperature the oil film thickness is reduced to a point that component wear increases. There are three different engine oils available in the Energy Efficient oils range covering both petrol and diesel vehicles. The formulations come in both full and semi synthetic form with viscosities of 5w30 and 10w40. The friction that occurs within the transmission is also a contributor to a loss of efficiency. In a gearbox, the friction is caused when the components move against each other with a sliding and rolling action, this is different to the purely sliding action of an engine piston and requires a different oil formulation to absorb the extreme pressure created between metal components. A specially designed formulation has been created for the Energy Efficient range, EE Transmission 75w90. find the locations of distributors please visit www.millersoils.co.uk. EE Transmission 75w90 - A fully synthetic transmission oil to provide maximum protection and fuel economy. For use in car and light van manual gearboxes and axles where the ultimate performance gear oil is required. commercial vehicle oils, classic vehicle oils and Industrial lubricants. Another advert pretending to be news. This site is full of them. Toyota latest Aygo say 0w 30, and 5w 30 only at a push,then revert. has anyone seen the cost of these specialised oils, per litre! liquid gold! .... now theres an idea.!!! !